As I spend a large proportion of my time working in a building associated with Mackintosh, I have made it a personal mission to visit all of his remaining buildings, whether original or reconstructed (Glasgow loves to move her buildings around every so often). For those who don’t know, Mackintosh was an architect at the beginning of the 20th century, designing incredibly modern buildings (soon to become Art Nouveau) which didn’t quite please the Edwardians and their penchant for Greek and Roman styles, but which are now utterly celebrated and recognised all over the world. This mission may take a while to complete; Mackintosh designed as far afield as Northamptonshire and his interiors occasionally pop up in unexpected places, such as Bridge of Allan. Unfortunately I had run out of bus money for this week so decided to tick one of the closer buildings off my list: Queen’s Cross Church is situated on Garscube Road and I’d be lying if I’d said I’d spotted it the first time I walked past. When you know where to look, the distinctive Mackintosh quirks begin to emerge from the exterior; organic curved lines feature in the Gothic style windows (but you have to be inside before you have any indication of the vibrant colours) and botanical engravings appear above the doors. 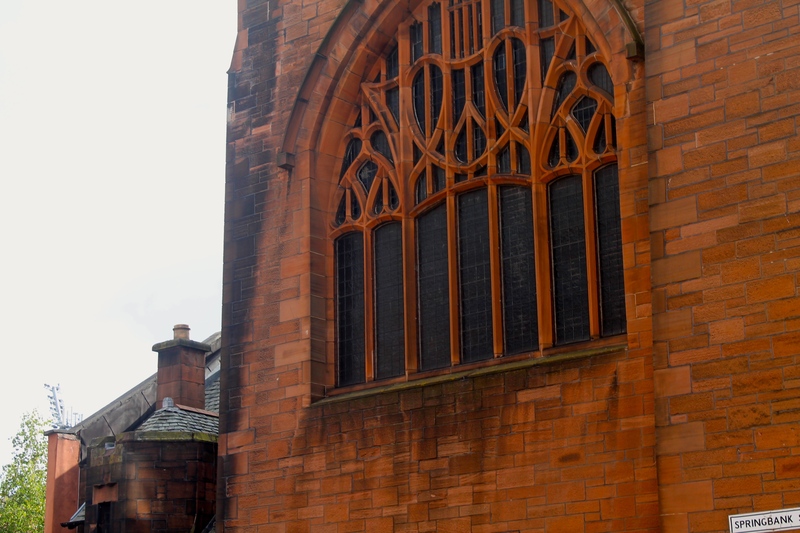 Until you notice this, however, it could be just another of the churches found all over the city, rather than the only one to have been designed and built by Glasgow’s most eminent architect. The entrance (try the doorbell) takes a while to figure out, and then we are welcomed inside by the guide, who recounts some of the stories of the church and points us in the direction of the leaflets and the way up the towers – any day out worth its salt simply would not be complete without some tower climbing. The initial impression is overwhelming yet doesn’t quite make you feel small in the way other churches do – a huge space is made cosy by dark panelling and colourful stained glass, whilst the vaulted ceiling above is the perfect mix of the traditional Scottish kirk with a modern twist of steel rivets and plates… Mackintosh was a child of the booming industrial revolution in Glasgow, after all. It’s impossible not to be drawn towards the ‘blue heart’ window and the chancel (raised area at the front). Once you have taken in the bigger picture, the details become all the more eye-catching. 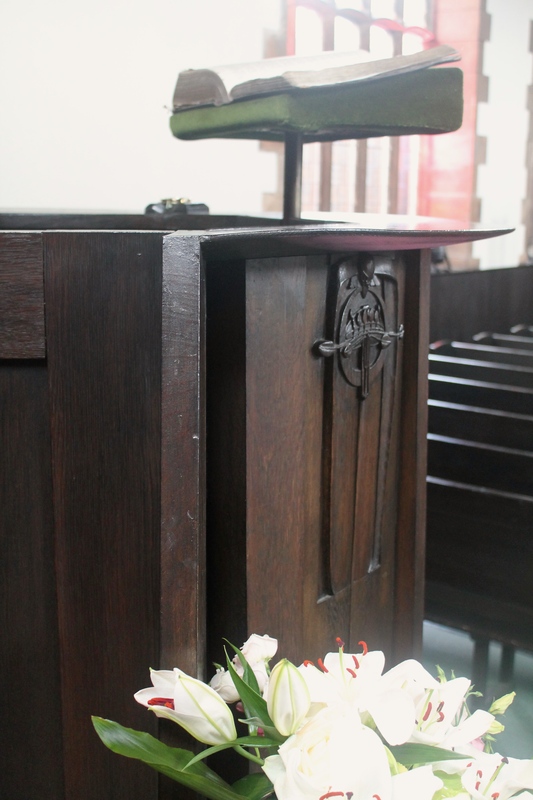 The wall panels are home to carvings of plants and seeds, a theme to be found throughout the church. A bird emerges from the pulpit, appearing engrossed in some seedlings below and friendly-looking insects sit, carved below the collections dishes. There is more to explore in the hall, vestry and upper galleries. The church was commissioned in 1896 by the Free Church of Saint Matthew. At the time, Mackintosh was a relatively new trainee architect working for local firm Honeyman and Keppie. 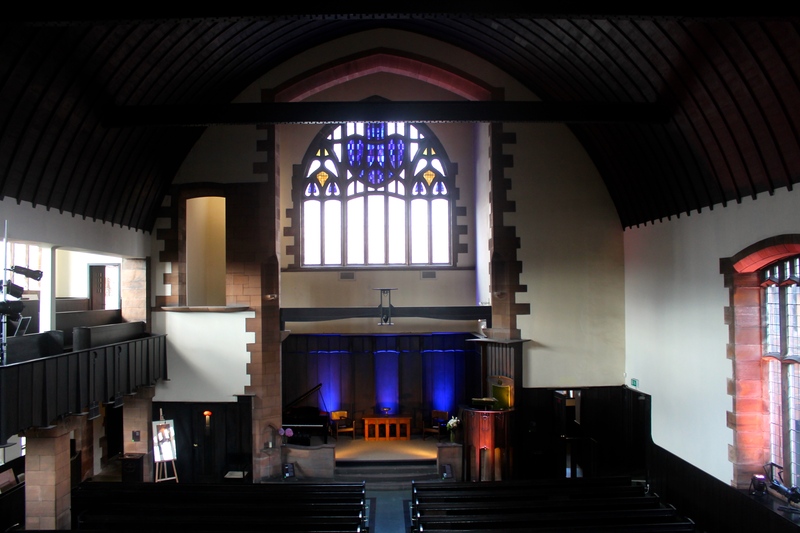 Recognising a potential harmony between the simplicity of design requested by the congregation, and Mackintosh’s developing style of clean, modern lines in his work, Mr Honeyman set Mackintosh the task of designing the church. Mackintosh envisioned architecture with harmony throughout, where everything from bricks, to engravings to lightbulbs was carefully thought out; contributing to the overall effect of the space. The church was used for worship for over 75 years. 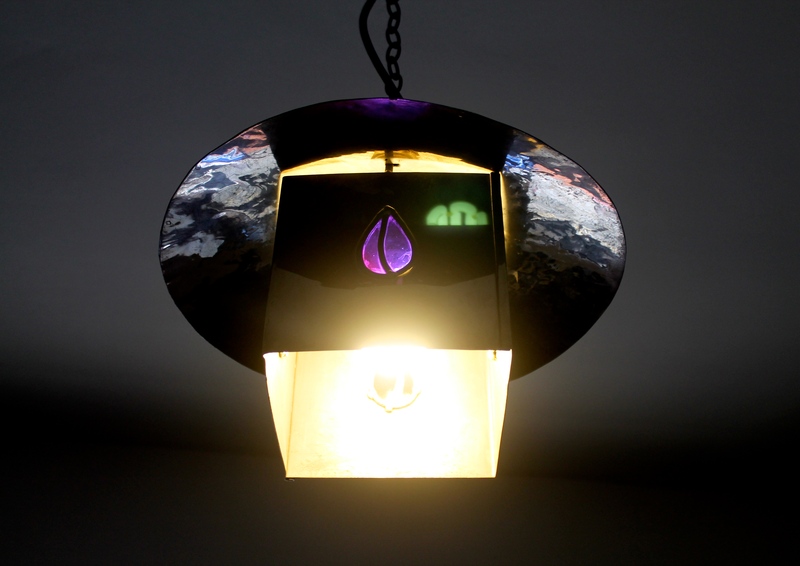 It is now home to the Mackintosh Society and open for visitors regularly, so pop in for a quick culture hit at some point and enjoy some of the few remaining examples of original Mackintosh in his home city. Unmistakable on the inside. Beautiful.